Lynn Shanghai Cuisine is a dumpling and noodle house located at the very centre of Sydney. Not far from Hyde Park, the restaurant offers a clean and inviting environment with great values for its dishes. Food here have a great emphasis on freshness. One can even catch a view of the noodles and dumplings being made by it's experienced chefs. The staffs work at a great pace to issue customers with menus, on which orders can be ticked off, rendering the ordering process simple and efficient, without having someone breathing down your neck. 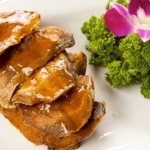 There is a great range of traditional Chinese dishes on the menu. The Shanghai steamed pork buns are especially tasty. Other dishes worth a try include Beijing style shredded pork, served with pancakes and braised spare ribs in special vinegar sauce. Desserts on offer here are all very unique with some brilliant takes on presentation, such as the sweetened glutinous rice balls in rice wine. Ideal for balancing out all the other savoury and spicy dishes. Overall, high standard of food and service along with great ambience makes for a worthwhile dining experience.